In celebration of International Compost Awareness Week, I invite our readers to dig a little deeper into the many benefits of utilizing compost. In a nutshell all composting is, is just nature’s way of recycling. It is a natural process of breaking down organic matter and turning it back into a rich nourishing substance. With this comes a lot of nutrition and benefits for your landscaping and gardening. Microorganisms produce a rich earthy substance called humus that is the key component in producing fine compost. Though most people think that compost is a fertilizer, it is actually a soil amendment. Fertilizers add nutrients to soil; while amendments improve the soil so that plants can make use of those nutrients. A simple way to distinguish the two is to remember that compost feeds the soil and fertilizer feeds the plant. What Can Compost Do For You? Reduces the need for chemical fertilizers. 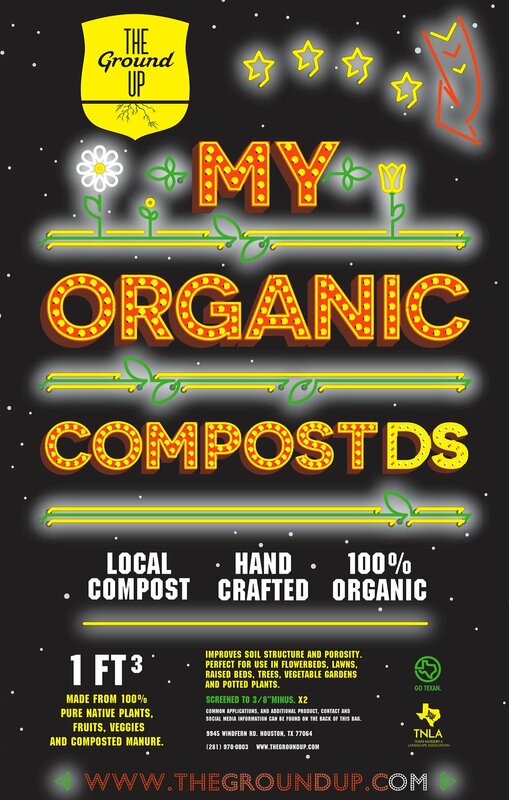 We celebrated this week by releasing our new "My Organic Compost DS" bag design. This double screened goodness will be available to you in a few weeks at any of our locations. We love it and we know you will too. DS is made from leaf mold, wood, vegetative debris. We ground up the raw materials and make windrow piles by folding fruits and veggies into the piles. The juices from the fruits and veggie keep the compost with an optimum moisture content during the composting process. In addtion, we also populate the piles with a microbe pack that allows for better composting. The piles then are turned and once the pile is mature and ready for processing, we screen a 1st batch with a 3/8" screen. This product is now called Vegan Compost. The following step is to take batches of Vegan Compost and screen again. For every yard of Vegan Compost we double screen we get 60% of Finished DS product. How can you use our Compost DS? Our compost DS is probably one of the finest fungal compost products you will see anywhere in the US. It's perfect for top dressing, amending, tilling, mulching, spot treating and as a general use compost. Spread about a half-inch to an inch of compost around your trees, shrubs, and/or your lawn, and in your annuals and vegetable gardens. In established gardens, spread the compost on top of the soil, where it will eventually seep into the ground below; or you can lightly fork it over. This can help improve the first 6–10 inches. Questions about our Compost DS or just compost in general? Head on over to www.thegroundup.com/askusanything and ask away! We are happy to answer any questions you may have. If you'd like to see samples of our Compost DS, please visit one of our locations and we will show you this goodness packaged in a 1 cubic footbag!